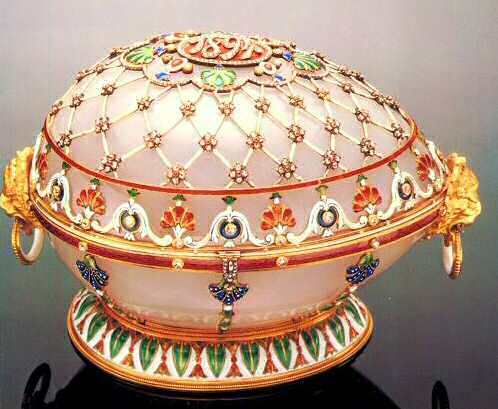 The 1894 Renaissance Egg is made of gold, white agate, diamonds, rubies and green, red, blue, black and white enamel. Missing surprise: probably pearls. The Egg is richly decorated with colorful stones. 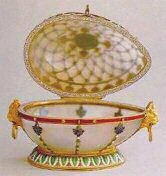 The name for the Egg comes from the source of its inspiration, as well as the Renaissance-style enameled foliate motifs. 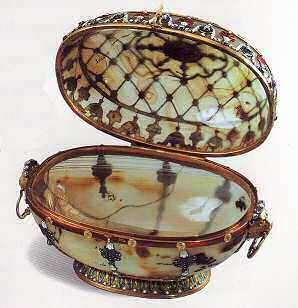 The Egg, made of milky agate, is trellised with opaque white enamel gold bands. 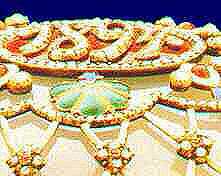 At each trellis intersection there is a quatrefoil of diamonds with a ruby center. The Egg is bisected by a red enameled gold band. Under the bisecting band and around the red enameled top, the Renaissance-style motifs, set with diamonds and cabochon rubies, are placed. The top has the date, 1894, set in rose diamonds. The lion's masks at either end have swing handles. This egg was the last to be presented to Maria by Alexander III before his untimely death just eight months later. 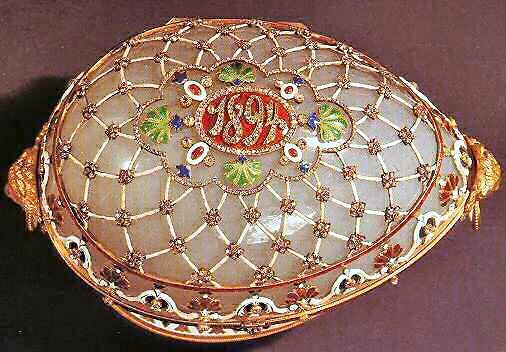 Carved from a block of milky agate, this Egg, mounted on a gold enameled base, was closely modeled after an seventeenth-century box by Le Roy, located in Germany, in the Staatliche Kunstsammlungen Dresden, Grünes Gewölbe Museum. 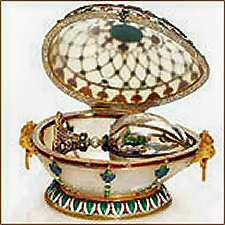 The surprise has been lost and is not detailed in Fabergé's bill, however the invoice mentions pearls, and since there are no pearls on the Egg itself, they may have been for the surprise. This is one of the few Imperial Eggs, designed to sit sideways. Another is the 1907 Imperial Love Trophies Egg. A highly intriguing hypothesis has recently been advanced by Christopher Forbes, namely that the Resurrection Egg is in fact the surprise originally contained in the Renaissance Egg. This would account for its being shown in the same showcase at the 1902 exhibition, where surprises have been separated from their eggs. Moreover, style and coloring of both objects are virtually identical and the size of the Resurrection Egg perfectly fits the curvature of the egg. 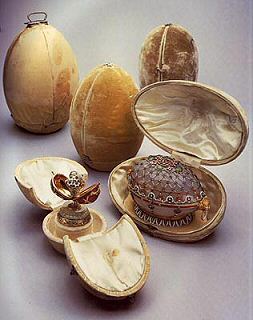 The invoice of the Renaissance Egg mentions a pearl, which is not accounted for unless it was part of the surprise. This work of art does not bear an inventory number, which speaks in favor of an Imperial presentation, a hypothesis which would explain why the Resurrection Egg is not included in the generally accepted list of Imperial eggs. Debate on this proposition continues among Faberge scholars! 1930 one of the ten Imperial Eggs sold by the Antikvariat in Moscow to the Hammer Galleries, New York. 1937-1947 Owned by Henry Talbot de Vere Clifton, millionaire landowner, sportsman and poet, UK. 1949-1958 Owned by Mr. and Mrs. Linsky, New York. 1958 bought by A La Vieille Russie, New York, from Mr. and Mrs. Linsky. 1965 Sold by A La Vieille Russie, to Malcolm Forbes, the Forbes Magazine Collection, New York. February 2004 bought by the Vekselberg Foundation/The Link of Times Foundation, Moscow, Russia together with 8 other Imperial Eggs. 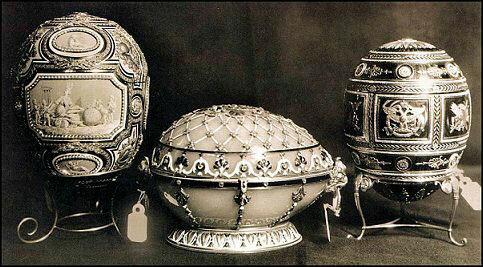 The 1914 Catherine the Great Egg, the 1894 Renaissance Egg and the 1912 Napoleonic Egg photographed in Moscow in the 1930's before they were sold abroad. Courtesy Fabergé Research Newsletter, April 2017.